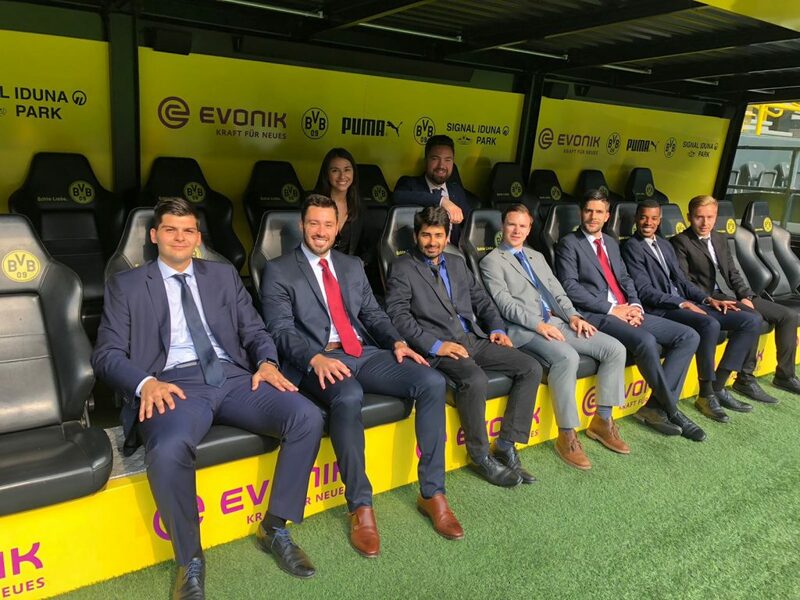 The FBA candidates undertook a 2-day trip to Germany to visit 4 different stadiums. The Commerzbank Arena, Veltins Arena, Signal Iduna Park and Merkur Spielarena. 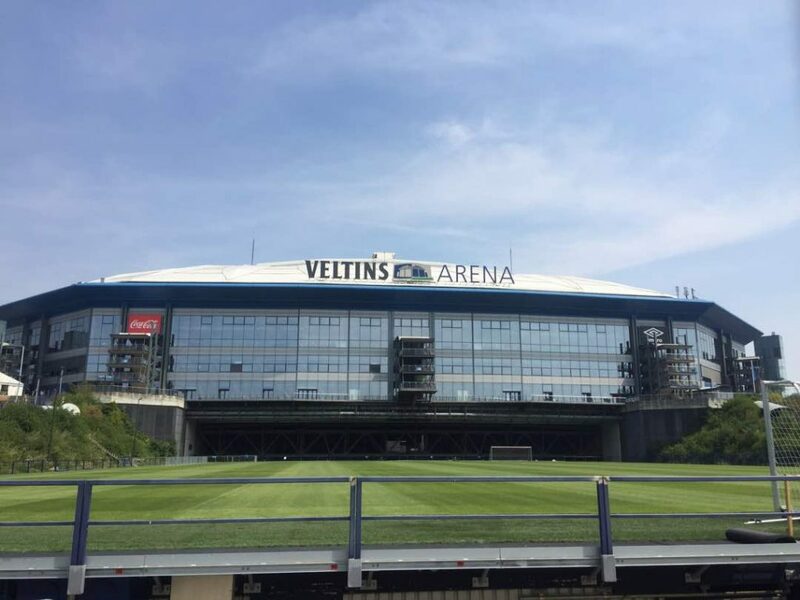 The aim was to gain a deeper understanding of each construct through presentations and stadium tours and imparted wisdom from representatives of each Bundesliga club. 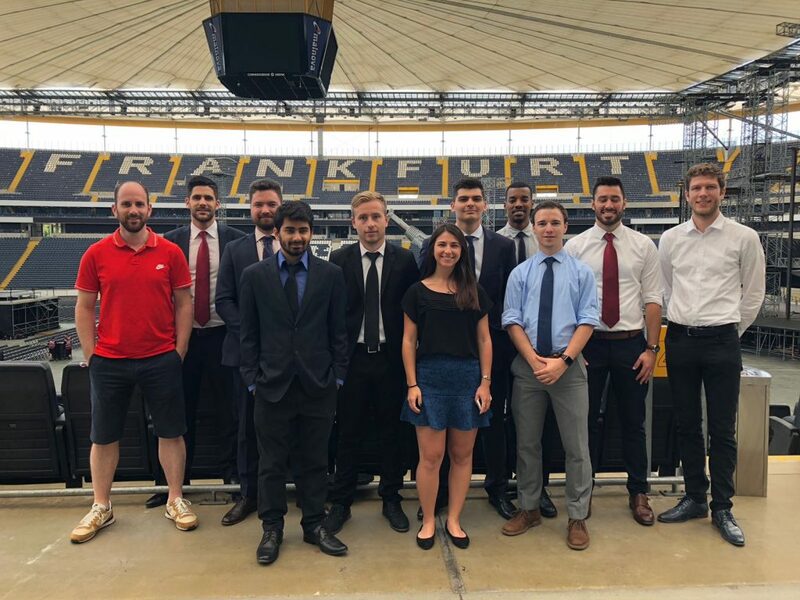 Expertly organised by ESSMA, the trip was a massive success that left the candidates tired, inspired, a practical application to the theoretical knowledge gained and four completely unconnected and different approaches of how to maximise the potential of stadiums both in football and beyond. The tour officially began on the Thursday morning at the Commerzbank Arena, home to Eintracht Frankfurt. The stadium, superior in size and with perfectly prepared training pitches, was a sight to behold from both the inside and out. Sadly, due to hosting a Helena Fischer concert in the coming days, the pitch was not visible. Despite this it was easy to see the combination of tradition and modernisation in the structure, from the old American Football commentary boxes ornately remaining at the top of the stand to the rapidly expanding roof that covers the entire structure and enabling it to become a year-round venue. The most inspirational element of the experience was the presentation the candidates received about the events and stadium innovations the team generates on a regular basis. The club prides itself on being a proactive unit, aiming to be “ahead of the game” in ways to utilise the stadium. Through extensive research, partnerships and inspiration from other successful stadiums across Europe, the arena has managed to host a wide range of non-sporting events to fill up the empty schedule freed up by the end of the football season. By pushing themselves to think outside of the box the stadium has held ground-breaking E-sports events, multiple international concerts, business events, Monster Truck extravaganzas and drive-in cinematic experiences. The club is always aiming to find new ways to maximise the stadium’s potential. The accessibility to public transport, high capacity (51,500) and availability to host open air or closed events has allowed the club to continue to create and innovate new ways to attract large audiences to the Commerzbank Arena and highlight the incredible potential the city of Frankfurt has to offer. To all football fans, Borussia Dortmund stands apart from the rest of the footballing world for the most passionate and incredible spectacle created on home matches by adoring fans. The Yellow Wall of supporters that dance, sing, wave humungous banners and go into spontaneous frenzy when their teams scores, is like no other. Many stories have been made of the matchday experience at the Signal Iduna Park and walking around the black and yellow structure certainly made the hair on your skin rise. The playing surface itself was immaculate and the empty stands, whilst empty, still elicited images of the place bouncing under the wave of support at kickoff. The special colours, as rare in combination as the stadium itself, were plastered across the inside of the maze-like complex. Whether it was the fan shop, press-room, conference room or a simply walkway between two departments, the colours were unmistakable in their placement. Built from the concrete foundations that resided upon the plot of land before the stadium’s construction, the walkway circling the back of the seats gave off a cold and lifeless atmosphere. Whether it was by design or pure luck, the old structure simply plays as a pre-requisite to the delights as you walk through the arches to find your seat. A lot is made of the club’s history, the closeness of home and away fans as they enter the building and the difficulty in expanding the capacity, but in reality the current set-up just adds to the intensity of the matchday experience. Due to the high demand for tickets to games and the huge waiting list for season tickets, the club can afford to provide VIP experiences for anyone without having to go overboard on design or luxurious interior. This is by no means a lack of regard for the customer, but more that the “simplicity is in the design” and success in innovating the atmosphere on match day to sell the stadium to all fans across the globe. The Signal Iduna Park combines history, simplicity and a touch of grey with emotion and intensity to create a stadium full of vibrancy from its black and yellow heart outwards. From the old-school engineer’s box to the modern and commercially bright megastore, there are no illusions why the stadium is such a public attraction to football fans not just from the surrounding area, but to anyone that loves football. The Veltins Arena, home to FC Schalke 04, in its own right is a footballing work-of-art. Structurally, the stadium and its seats and VIP boxes were luxurious and tailored to the needs of their clients. What set the stadium apart was the “state-of-the-art” retractable football pitch. An 11-ton platform of pristine grass that could be removed from the stadium to allow greater room for events outside of football, was a sight to behold. As only one of 5 stadiums in the world to have such pitch technology that uses a gliding system to return the surface to the arena’s centrepiece which took 4 hours to fully enter the stadium, made the arena one of Europe’s unique structures. The club’s plans to also expand its training pitches and facilities, beginning in 2019, outlined clear visions of the club to build upon their strong connections with the community through football. Plans to build and host a total of 10 training pitches, a small 5,000 capacity stadium for youth matches and new offices with a walkway 1904 meters/steps from the arena (to remind the fans of the rich history of the club that started 114 years ago), are already in motion. The team has a clear vision to develop the level of football for all age groups inside by creating state-of-the-art training facilities close to home, as well as increasing the parking space for fans and audiences coming to view the quality of football provided by the club’s academy. For such a beautiful stadium, the connection and promises the club provides to the fans is what really captured the hearts of The FBA. FC Schalke have put a strong emphasis on not “robbing the fans of their money” offering affordable single and season tickets prices for a predominately working-class demographic. To enhance the experience further, supporters are treated to cheap concession prices and those looking for a more luxurious experience are treated to comfortable seats, free food and drinks and personally tailored executive boxes. There is a clear sense of putting the fan first and a memorial of fan photos joined together to create images of previous club legends identifies the only reason these greats were able to be here was because of the thousands of people supporting them week in, week out. The final stop on the tour was the Merkur Spielarena in Düsseldorf. Upon the candidates’ arrival the opening image was a gigantic crane removing the old name sponsor from the side of the structure for a new look logo, re-naming the stadium due to a sponsorship agreement with the council. Even if the fans might not have warmed to the name, the hard work and innovations going on behind the scenes for the newly promoted Fortuna Düsseldorf 95 should create a significant buzz before their opening fixture. As candidates were shown the 56,000-strong stadium, the attention was immediately drawn towards the multi-coloured seats scattered around all tiers. Having constructed the stadium for the World Cup 2006, only to be rejected as a stage for the tournament at the last minute, the fear was that the domestic side could not fill out the seats on live broadcasts. In attempt to make the place look more populated, the multi-coloured seats served their purpose as “extra fans” on home games. With the club’s return to the Bundesliga guaranteeing hordes of spectators to the game, the council’s current refusal to change the seats to all red and white hasn’t stopped the club from creating a multitude of ways to create a better connection with the fans and plans to battle against the financially richer clubs above them. The club puts emphasis on merchandising innovations such as special edition shirts for the first stage of the Tour-de-France, to club labelled bottles of locally distilled Gin. Apps and OTT platforms are continually being renovated to provide an easier and cleaner customer experience online, as well as increasing fan engagement through such events as virtual shirt unveilings in line with the opening day of one of the most popular Holidays in Düsseldorf. The stadium has all of the facilities required for hosting elite football, which are long overdue recognition after their snubbing 12 years ago. The capacity is there, the surface is under careful care and attention, the changing rooms, press rooms and offices are alive, but the meticulous work going on behind the scenes by the small, yet creative football staff are creating a rapidly growing environment that is captivating fans and persuading more to join the team in taking on Germany’s greatest opponents. The entire experience over the 2 days demonstrated that despite the obvious fact that these stadiums are incredible in their structure, they are equally unique in their own ways which makes them so important to the fans and the local community. Whether it was retractable pitches, forward-thinking event innovations, unparalleled fan experiences or creative marking and communication with the fans, the experience provided by ESSMA gave all of the FBA candidates an insight into the world of stadium operations that no book could ever wish to impart on you. Ben Cronshaw is a Candidate of The FBA’s Professional Master in Football Business, expected to graduate in August 2018. He can be contacted via LinkedIn.